Absolute excellent care! The staff is very friendly and extremely helpful. — Jennifer S.
Our expert optometrists and friendly staff will take the time to answer all of your and your family's questions, explain vision treatment options, and provide the highest quality eye health treatments that fit your unique personality and lifestyle. Built on the foundation of patient convenience and satisfaction, Complete Eyecare Associates serves all of your family’s eye care needs under one roof, including a wide array of designer eyeglass frames in our on-site frame gallery, which is open every day of the week. We're looking forward to your visit to our modern facility and friendly doctors and staff! Contact us today to schedule your next eye exam. 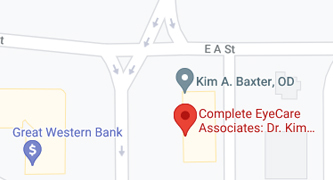 For your convenience we have an in-office lab that enables us to have glasses made the same day (depending on prescription) and also a drive-up window where you may pick up your contacts or glasses and schedule appointments.